M T D N o v e m b e r 2 0 1 8 4 E d i t o r i a l T wenty-two years ago, the National Tire Dealers and Retreaders Association (NTDRA) was at a crossroads. Attendance and exhibitor participation at its 1996 con- vention and trade show in Atlanta were down compared to the previous year, continuing what seemed to be an inevitable trend toward oblivion. Membership was declining. e organization was not financially sound. 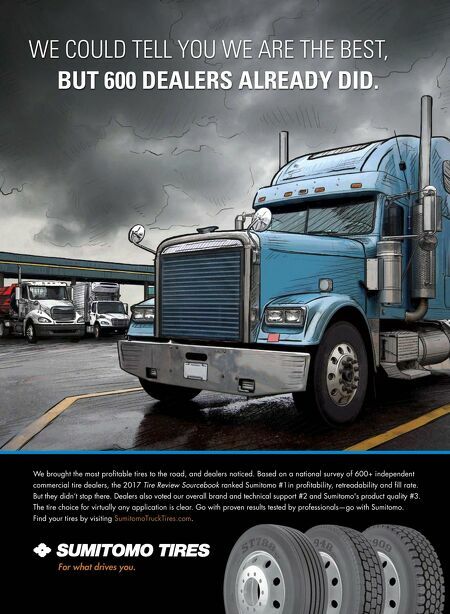 Something needed to be done to stop the bleeding and move the tire dealer association forward, maybe even save it. Hoping to do just that, the NTDRA hired David Poisson to replace longtime executive vice president Phil Friendlander, who officially retired Jan. 1, 1997. Poisson only held the post for four years, but it's safe to say he helped set the foundation for the success of the Tire Industry Association (TIA) today. Perhaps his two biggest accomplishments were: • contracting with the Specialty Equipment Market Association (SEMA) to join the SEMA Show in Las Vegas. Poisson basically gave up control of the NTDRA Show, but the guaranteed money to the association every year steadied the nonprofit organization's balance sheet. • broadening the organization's membership base. e name change to Tire Association of North America (TANA) reflected the move from a strictly tire dealer association to a tire industry association. And eventually, it became exactly that: the Tire Industry Association. It is not farfetched to believe he also set the stage for the merger of TANA with the International Tire & Rubber Associa- tion (ITRA), which, among other things, brought much needed training programs — and Kevin Rohlwing, TIA's eventual senior vice president of training — into the group. Call it the six-degrees of David Poisson. ere were also the expected cost-cutting measures, including a move from Washington, D.C., to Reston, Va., and a considerable downsizing of the board of directors, which made decision-making more efficient. At that first SEMA Show in Las Vegas, the TANA show's attendance by dealers and exhibitors exceeded 6,000, more than double the number of people who attended the 1996 stand-alone convention and trade show in Atlanta. A lot of people were responsible for bringing new life into the organization and propping up the convention. It was a team effort, but Poisson was the catalyst. I bring up this history lesson to show that in a moment of crisis, the organization found a way to reinvent itself. Recent grumblings that the big tire manufacturers are not exhibiting at TIA's Global Tire Expo are nowhere near the problems the association faced in 1996. e rise in Chinese tire manufacturers exhibiting at the Global Tire Expo has partially made up for the loss of big booths from Goodyear Tire & Rubber Co., Bridgestone Americas Inc., Michelin North America Inc. and this year, Pirelli Tire North America Inc. Also know that all four companies still support the convention and trade show in other ways. Prior to the merger with ITRA, TANA's membership was less than 5,000, and even aer the second name change, membership plateaued at 5,000 for years. Today there are more than 13,700 industry members. e importance of TIA's ability to help tire dealers run their businesses more profitably (that's our mission statement, by the way) cannot be overstated. TIA and the U.S. Tire Manufacturers Association are trying to steer the National Highway Traffic Safety Administration on the right path when it comes to finalizing the rules for the tire registration and recall system. Mandatory tire registration at the point-of-sale became law in December 2015. How the requirements of the system are worded will affect tire dealers greatly, so it is important they are heard on the topic. at's where TIA comes into play. (Keeping you from having to turn over customer data to your suppliers is the real issue when it comes to tire registration, so let your voices be heard.) So TIA and the Global Tire Expo are fine. e convention and trade show are just evolving. And TIA is still paid annually for being part of the SEMA Show. As for Poisson, he also is doing well. For the last seven years, he has been CEO of SCG Legal, a global network of more than 11,000 attorneys from 148 of the profession's preeminent independent law firms around the world. Twenty-two years later, I offer my thanks to Poisson for helping a battered tire dealer association realize its potential. And you should, too. ■ If you have any questions or comments, please email me at bob.ulrich@bobit.com. 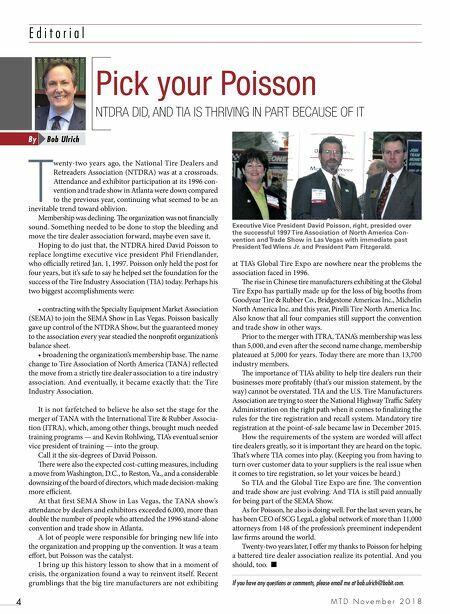 Pick your Poisson NTDRA DID, AND TIA IS THRIVING IN PART BECAUSE OF IT Bob Ulrich By Executive Vice President David Poisson, right, presided over the successful 1997 Tire Association of North America Con- vention and Trade Show in Las Vegas with immediate past President Ted Wiens Jr. and President Pam Fitzgerald.